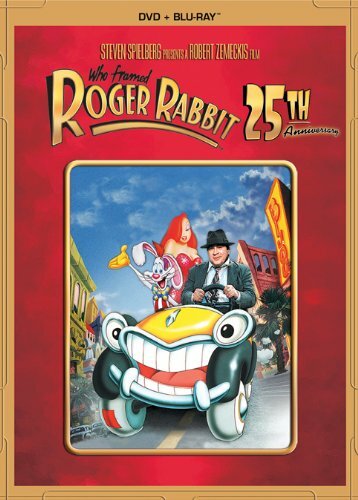 CHICAGO – When “Who Framed Roger Rabbit” was released 25 years ago, it was a revolutionary critical and commercial smash on its way to four Oscars, including a special Academy Award created just for its amazing technical achievement (live-action and animation may be as common as McDonald’s commercials now but not in 1988). However, not every film from the late ’80s has held up well. In fact, most of them work more as nostalgia than anything else. (Case in point, the recent-to-Blu-ray “Willow”). Does “Roger Rabbit” still work? Does it ever. Watching the film on this long-overdue Blu-ray release, I was stunned by how great it still works in every way. It’s a classic. Why has Robert Zemeckis’ classic held up while others have not? I think the lack of ’80s-specific references really helps the piece feel timeless and the performances and fantastic script would work in any era. “Roger Rabbit” is just a fun, smart movie and there’s too little of that in family entertainment. The Blu-ray is a stellar one although lacks the kind of new bonus material that would have really made the LONG wait for this release more bearable (all the material here was on the DVD version). A new audio track, a retrospective featurette, something that explains why it’s taken so long for a sequel (which Zemeckis himself implied is back in the works again, as has been rumored so many times in the ’90s and ’00s) would have been nice. The real draw here is the HD restoration of the film and the three Roger Rabbit short films that played in the years after this smash hit was released. Unlike most anniversary release special editions, it’s the movies themselves that really matter. Roger Rabbit rules. On Blu-ray for the first time ever, this digitally remastered edition of Who Framed Roger Rabbit practically jumps off the screen with its brilliant picture, rich sound - and dangerous curves. It’s 1947 Hollywood and Eddie Valiant (Bob Hoskins), a down-on-his-luck detective, is hired to find proof that Marvin Acme, gag factory mogul and owner of Toontown, is playing hanky-panky with femme fatale Jessica Rabbit, wife of Maroon Cartoon superstar, Roger Rabbit. When Acme is found murdered, all fingers point to Roger, who begs the Toon-hating Valiant to find the real evildoer. Complete with hours of bonus features - including three digitally restored Roger Rabbit Shorts, this multi-Oscar winner (Best Film Editing, Best Sound Effects Editing, Best Visual Effects, Special Achievement In Animation Direction, 1988) is pure magic in Hi-Def Blu-ray. “Who Framed Roger Rabbit” stars Bob Hoskins, Christopher Lloyd, Charles Fleischer, and Joanna Cassidy. It was directed by Robert Zemeckis and released on Blu-ray on March 12, 2013. Submitted by lestat60628 on April 2, 2013 - 9:54pm. I can’t wait to own this!